Home MusicEar To The Ground	Curls, Coils & Cocktails Is Back, With A Musical Twist! Curls, Coils & Cocktails Is Back, With A Musical Twist! 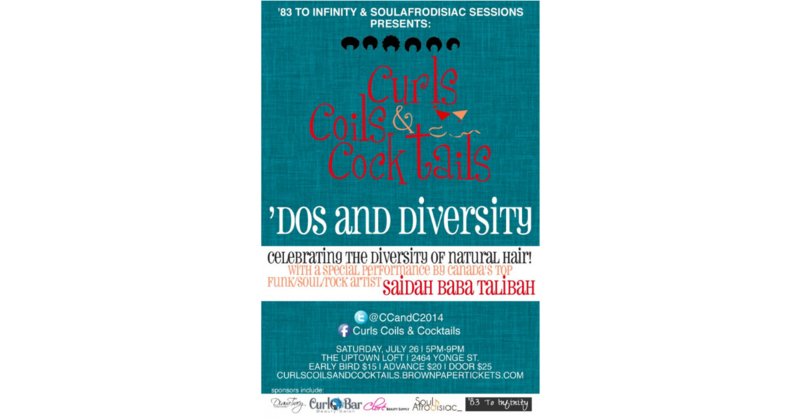 Last year in May, my girl Bee Quammie from ’83 To Infinity and I were asked to put together an event for a natural hair group we are both members of called Curls, Coils & Cocktails. Unbeknownst to us, the journey that this event has taken us on has been absolutely amazing. The soiree last year was well received by TV, print, naturalistas and fashionistas in Toronto and beyond as a night of fantastic vibes, networking, and in-depth discussions that left everyone wanting for more. Needless to say, we had to listen to the peoples and make it an annual occurrence. Besides, like Bee and I say ”The skreets were callin’!” 😉 – so here we are with another round of Curls, Coils & Cocktails on Saturday, July 26th (purchase your tickets here)! This year, we have decided to up the ante a bit and bring the fierceness to you. We found a fantastically central and snazzy venue (The Uptown Loft), we have an awesome panel in store for you where we will be discussing our theme this year entitled ‘Dos and Diversity. Our gift sponsors and event sponsors (Curl Bar, Cloré Beauty, The Toronto Natural Hair & Beauty Show and a host of others) are equally fabulous in their own way, and of course, I have to jump for joy about our new segment this year – the artist showcase! Y’all know I live for music and everything it encompasses. With that being said, Bee and I are ecstatic to have a performance and Q&A portion with Canada’s top funk/soul/rock artist Saidah Baba Talibah! Because we (we being the loced down sistas) have to fight for some love on the natural front (listen, y’all know I`m speaking the truth! ), Bee and I thought it would be fantastic for Saidah to share her loc journey with us, along with that incredible gift she was blessed with. And of course, we surely can’t forget the importance of cocktails! I am SO EXCITED! We’re looking forward to seeing each and every one of you there!